If there's a one-word description for the Epson Artisan 810 multifunction device, it's "ambitious." Unlike most of the All-in-One devices we've reviewed recently, the 810 can fax (even in color), print on CD/DVDs, charge your portable devices and talk WiFi and Ethernet. And it offers a large, attractive (and smart) touch panel to control operations. Oh, it also prints photos from 4x6 to lettersize on a variety of Epson photo papers using a six-color, dye-based Claria inking system. There's no transparency unit to scan film, but that's about this AiO's only limitation. • Smart, 7.8" touch panel. Large display lights up only the buttons you need; includes a 3.5" LCD to preview, edit and print photos and more. • Built-in Wi-Fi and Ethernet networking. Print, scan, and access memory card slots via built-in wireless and wired networking. • Ultra Hi-Definition prints. Brilliant 4x6 photos in as fast as 10 seconds; DX5 MicroPiezo technology provides the finest color and detail without sacrificing speed. • Professional looking CDs/DVDs. Print right on inkjet-printable CDs/DVDs, without labels. • Send faxes fast, even in color. Fax in as fast as three seconds per page; store up to 60 speed dials and receive up to 180 pages in memory; also faxes legal-size documents; includes PC Fax1 software. • Versatile paper handling. Automatic, two-sided printing, and two automatic paper trays, plus 30-page Automatic Document Feeder to quickly copy, scan or fax stacks of originals. • Easily charge portable devices. Free up a power outlet; charge cell phones and MP3 players. • One-of-a-kind projects. Easily create coloring books, personal note paper, invitations and greeting cards using your own photos, PC-free. • Perfect photos made easy. Auto Photo Correction and red-eye removal with and without a computer. • Bring old, faded photos back to life. Easily restore the color to faded photos. • Results ready to share. Lab quality photos are smudge, scratch, water and fade resistant. • Epson Preferred program. Two-year limited warranty and free lifetime customer phone support with registration. • Individual ink cartridges. Replace only the color you need. • Print from an iPhone or iPod touch. Enjoy wireless printing from various mobile devices. The Epson Artisan 810 supports Windows 7, Windows Vista, Windows XP, Windows XP x64, Windows 2000 Mac OS X 10.3.9, 10.4.11, 10.5.x and 10.6.x (PowerPC or Intel processor). For the latest information regarding Snow Leopard support, visit http://www.epson.com/support/snowleopard". Bundled software includes Epson printer driver, Epson Print CD, Web to Page, Epson Scan, ArcSoft Print Creations, Epson scanner drivers, Presto, PageManager Color Management. Note that a USB cable is not included. 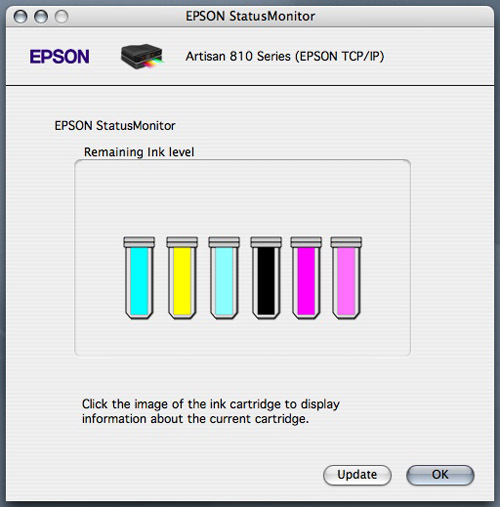 Epson sells the standard 99 cartridge and the high-capacity 98 cartridge for the Artisan 810's dye-based Claria inks. Epson claims the inks on Epson media are fade resistant for 98 years on display or over 200 years in dark storage. The 99 cyan, magenta, yellow, light cyan and light magenta cartridges are $10.44. A multipack that includes cyan, light cyan, magenta, light magenta and yellow is available for $52.94. The 98 high-capacity color cartridges are $15.99 each with a multipack for $79.99. A high-capacity black cartridge is $17.09. Media for the Artisan 810 includes printable CDs and DVDs, iron-on cool peel transfer sheets, photo quality self-adhesive sheets and premium and ultra premium photo papers in a variety of finishes. 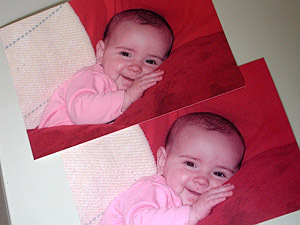 A pack of 100 sheets of 4x6 glossy Ultra Premium Photo Paper is $25.50. The Premium grade is $16.20. A pack of 25 sheets of lettersize glossy Ultra Premium is $19.80. The squat Artisan A810 takes up quite a bit of room with the built-in duplexer on one side (the back) and the LCD and output tray which extend on the front side. The scanner is actually perpendicular to the print path, making it among the larger AiO devices we've reviewed. Unlike many other AiO devices, the Artisan 810 includes a document feeder with a capacity of 30 sheets, pretty essential on anything that faxes. The feeder itself is also a cover. To use the cover as a feeder, you open the short panel and fold it back on itself, revealing the feed. Fan the paper, tap it tidy and slip it into the feeder, front side up. 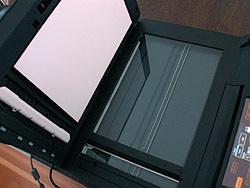 The scanner handles originals as large as letter size paper (or two photos at a time) but the cover does not extend to accommodate thick material like bound books. A fax is built-into the Artisan 810 as well but we didn't test it. We are subversively trying to bury the fax as a way of communicating since the text conveyed is only a crude image that can not be OCRed. Indulge us. The very large touch screen is hinged near the top and gives a little whenever you tap on it. That's an unfortunate design. There's something annoying about the give. It also requires you to hold in an Unlock button to lower the display, not something you might be inclined to do. But you can break the thing if you don't. Again, another unfortunately engineering decision. The screen stays where it is, so to lift the scanner up to install ink cartridges, say, you grab the area to the right of the screen. Again, not something you'd guess. It's a pretty small area to suggest it would allow you inside. But it does. While the large screen is touch sensitive, it's really three screens in one. The middle screen is entirely live but the two on one either side of it have button areas that are live only. Not a big deal. The buttons light up (in amber) when they are active and disappear when they are not, making it pretty easy to learn them. Of course, it's not a great layout (you are looking all over the place all the time). The buttons are laid out in a grid of two across and three deep on each panel. Some buttons are split into two (plus and minus, for example). And they never change, so you learn them. We did get lost navigating with them and the main LCD. It was, for example, hard to remember how to get to the command to copy a photo (click the Copy button not the Photo button but you then have to press the Menu button to see it). Under the LCD is the output tray, which extends in four small shelves, that last of which flips up so paper doesn't fly out. It's fairly well obscured by the LCD but even more obscured is the input tray below it. You can reach under the extended output tray to yank out the input tray, though. The input tray itself has a very intricate design that accommodates letter-size paper on the bottom and up to 5x7 photo paper in a separate tray on top. Rumor has it that the Artisan jams. But we didn't experience any jamming. As always, we fan the paper before filling the tray and we let things sit around a while before using them so they become acclimated. To the right of the trays is the card reader with slots for larger CompactFlash cards and smaller SD/xD/MS cards. It is nice to see CompactFlash supported. 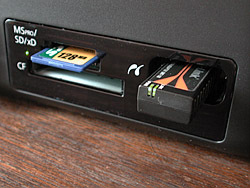 The device can function as a card reader, copying images to your computer (even wirelessly). On the back, the right corner has the power connection while the left corner has all the data connections: USB, Ethernet, telephone line in and out. A large installation poster provides a handy general guide to installation, but not the details. There are handles on the plastic bag that the A810 arrives in. Lay the box on its side and pull on them to slide the device out of the box. It's an unusually complex piece of equipment with lots of little pieces, all taped down in blue tape. Take your time to remove them. You'll find the longest one attached to the paper warning on top leads you to the scanner lock that must be removed. Don't neglect to take the tape off the paper tray pieces, either. There are a lot of little blue tapes inside the tray and even more on the output tray. You power the device on before installing the cartridges. Use the Unlock button to raise the large touch screen. You have to set the date and time when you turn on the power. Then you'll be prompted to install the ink cartridges. The cartridges are vacuum sealed. They have one little yellow tab covering an ink hole on the bottom that you must remove. Leave the clear seal on the other ink hole. And just pop each of the six cartridges into place under the scanner. It takes about five minutes for the fully-loaded cartridges to charge the print head. Subsequent cartridges will consequently deliver more pages, Epson advises in the poster. Then add the paper. The trays accommodate letter size plain paper and photo paper up to 5x7. To connect the printer to the rest of the world, Epson provides a telephone cable (for faxing) and your choice of USB, Ethernet or WiFi network connections. We always go for the wireless setup so we have a little flexibility about location. It's a rather large, squat unit with the duplexer poking out the back, so being able to stash it in a dark corner is a big help. To setup a WiFi connection, you need to know your network name and the WEP or WPA password. We tapped Setup and then scrolled to Network Settings and the Artisan found our router. We confirmed that's what we wanted to connect with and then entered our password. When we got back to the home screen, we waited just a few seconds for the connection to be made. Simple as that, the Artisan was on our network. The next step, of course, is to tell the computers about it. Epson supplies a CD but warns users of the latest operating systems to check the Web for the right installers. We popped the CD into our antique and used the Easy install. Which installs thousands of files. We had to authenticate the installer quite a few times. There are quite a few application installers (like Print CD for printing on CDs). When we got to the network setup, things went very smoothly. 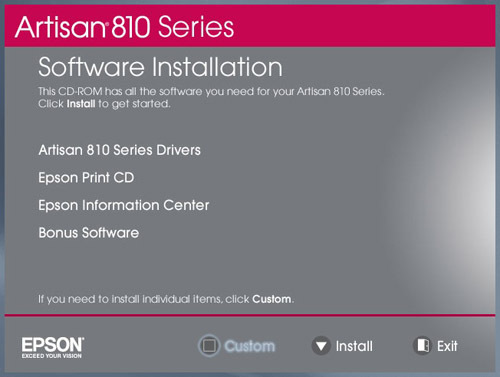 The installer found the Artisan and then took us to the Printer Setup utility for our operating system, with a little note about where to find the Artisan (More Printers and then let the browser find the new drivers before selecting Epson TCP/IP, which will bring up the Artisan). Simple as that, really. At the end of it all, the installer prompted us to print a test page from our computer. So we did that. The test page congratulates you on successfully installing the Artisan. All that without a restart, too. Very nice. But wait, you're not done. Bonus software installation includes options for NewSoft Presto! PageManager and ArcSoft Print Creations. We installed both. What's a few more authorizations? The whole installation took about an hour and twenty minutes, although we did take notes, photos and screen shots along the way. Before we leave this subject, we do want to applaud Epson for its documentation. The printed, 62-page Quick Guide is pretty comprehensive without bogging you down with too much detail. There aren't many topics it skips and it was our first resort when we needed help. But Epson also provides an HTML Info Center, very nicely laid out, that covers the Artisan in depth. And that means how to print on #10 envelopes, too. We were especially pleased to see the detail Epson devoted to explaining its printer driver options. These are critically important for getting good results and yet they often remain mysteries. The color management section is succinct but perfectly clear about what each option does. The Info Center also includes the interesting and usually neglected topic of packing the device for transport. 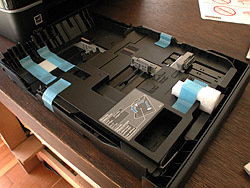 Printers and scanners are easily damaged in shipping and Epson spells out the details of how to prepare your unit for a safe voyage. The Artisan 810 can be used on its own like any copier, so that's where we started with our usual tests. Document Copying. To test the document copying function of the Artisan, we grabbed a New York Times Book Review and copied one of the reviews that had a nice color illustration we liked. The newspaper had been sitting around a month, so the paper had darkened a bit. The scanner picked that up as a slight gray tone, but we have to add that the Artisan lets you manually set the brightness level (not all AiO devices do). So if this had been objectionable, we could have lightened it up a bit. The color illustration came out very well, with the resolution of the original and yet with truer color (since the paper was really white and not yellowed with age). The text, of course, was sharp and distinct. Not much of a challenge for any scanner these days. It's worth pointing out that the glass isn't your only option for document scanning. You do have that feeder, too, for multi-page documents. That's a very nice option. Photo Copying. One of the real pleasures of an AiO device is just how easy it is to duplicate your photos. You're flipping through the old family album, telling a younger member who people are and who they resemble when it suddenly occurs to you that you could copy the photo for them. Our test photo is an infant on red cushions that's surprisingly challenging for many devices. That's usually because they are trying to match a high-fidelity print with just four colors. The dark hair is often lighter and the skin tone off. The Artisan, however, adds light magenta and light cyan to the usual four color mix of cyan, magenta, yellow and black. 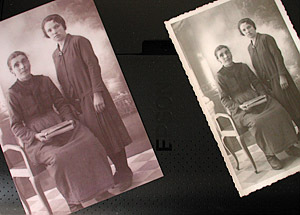 It also offers a photo restoration mode when copying a photo. Our original is in good shape, so we went for a straight copy, as we usually do. But we had to resort to the manual to see exactly how to copy a photo. The large touch screen LCD is a pleasure to use but the menus themselves are not well designed and the font is large but primitive. And, too, there are a few things you simply have to be told. Like how to place the original on the glass. We at first put it down in the wrong orientation (the 4x6 has to lay out with the short side matched to the short side of the glass) and the Artisan complained about it. Nicely. And we weren't sure if we should snug the print up to the edge of the glass or let it float. Let it float. One quarter inch away from the edge and any other print. You can do more than one. We also needed to know how to make a copy of a photo rather than a document. Copy/Restore Photos is a different menu option from the Home screen. After that, it went well. The scanner captured the image and displayed it on the LCD for cropping. You can also set the number of copies you want before continuing to the print settings display which had exactly what we wanted. A few seconds later we had a copy. A very nice copy, too. The blacks were as rich as the original and the detail was preserved. The crop was just a bit tighter on the copy to make a borderless print. The skin tones were pleasant but slightly bluer. That struck us as more natural than the warmer tones of the Canon original. But warmer is better than natural when it comes to skin tones. In short, it was one of the better photo copies we've made. We did have a 30 year old print laying around that had faded a bit in the sun. So we scanned that with color correction enabled and it did improve the image from the yellowed print to a much cooler version with realistic skin tones. Making color copies of photos may be technically challenging, but with all those old black and white images with no negatives in the family album, we were curious to see how it would do enlarging one to a 4x6. Our black and white copies retained the detail of the original nicely but they had a slight magenta cast to them. We weren't too happy with that, especially because there's nothing you can do to adjust it. With a color printer, you are likely to have a cast of some type. A warm cast is our preference, followed by a cool cast. But to have a magenta cast was disturbing. Printing digital files doesn't require a computer either. The card reader itself and the USB port on the front of the Artisan can feed data to the printer. Card Reader. The Artisan gives you quite a few options for printing images on a memory card inserted into its card reader. You can, as on most AiOs, go through the images one by one and print them. You can also print all of them. And you can even print an index of everything on the card. Most LCD-equiped AiOs don't trouble to offer this option. But Epson takes it all the way by letting you mark up the index for printing, too. You simply put the marked up index on the scanner glass, scan and the printer completes your order. The Artisan goes even further, though. It offers options to print Photo Greeting Cards (a scannable order sheet is printed with your selected image; you mark your choices; scan the order form; and your card is printed), picture packages (multiple sizes of the same image), plus 2-up, 4-up, 8-up and 2-up layouts of multiple photos. There are also options to print an image on the upper or lower half of a sheet, print four ID-size photos on a sheet, print a jewel case insert and print a jewel case index of 24 thumbnails. You can elect to place the photos manually or automatically, too. Finally, the Artisan can print frames from MOV, AVI and MPG video clips taken with your digicam. You can print individual frames or a set of 12 frames to print as thumbnails. We have not seen that trick before. USB Port. Yes, you can plug in a thumbdrive and walk through the LCD menus to print any photos the Artisan finds on it. But we were curious if the port could handle a Bluetooth dongle. So we popped a Bluetooth dongle on the PictBridge USB port, fired up our Razr with Bluetooth cooking and looked for devices. The Artisan was discoverable, so we copied a photo to it and it printed out very, very nicely. Templates. HP has inspired a ROM revolution in AiO devices, which now offer all sorts of built-in templates like lined paper and graph paper. The Artisan goes a bit further, offering to turn any photo into a coloring book page or a greeting card. Unfortunately, coloring book looked nothing like a coloring book. It looked more like a mezzotint. Oh well, points for the concept. Computer. Most of our photo printing is done from the computer through Photoshop or Lightroom or some such application. So we loaded the Artisan with Epson Premium Photo Paper in a Glossy finish and picked a few recent images to print. We didn't make it easy on the Artisan, picking two difficult Raw images, which we processed in Adobe Camera Raw. 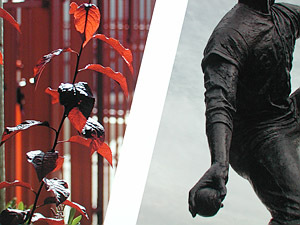 The first was a bronze statue silhouetted against the early afternoon sky. The clouds were high enough that there was some blue but the detail of the bronze statue, which filled the frame, was very dark. We had bumped up the Fill slider to bring it back. With Photoshop managing the color and the right ICC profile for the Epson Premium Photo Paper in Glossy (installed with by the Epson installer) we got an excellent print on the first try. As a dye-based printer using a swellable sheet we had to wait a while to see the image stabilize, but it was right where we wanted it. Only with a loupe could we detect the FM screen used by the Artisan. Even close up it looked like a continuous tone print to the naked eye. The second image was also shot into the sun. It was a stalk of red leaves, transparent in the late afternoon, against a maroon metal fence. The leaves ranged in color from almost black to a brilliant red. Again the Artisan handled the image without a hiccup. The first print was right on the money. Duplexing. The 3x4x11-inch cassette that sticks out the side of the Artisan is the duplexer, enabling double-sided printing. 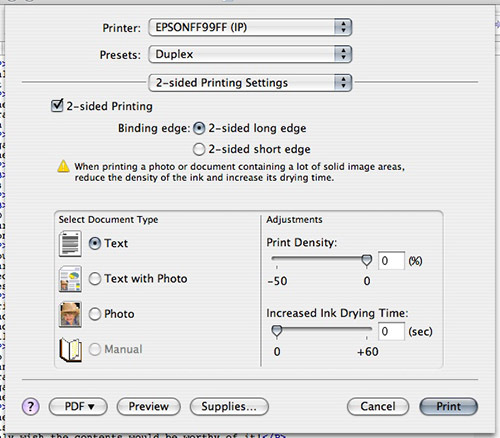 The 2-Sided Printing Settings dialog in the driver provides a simple but thorough set of options. The first is enabling two-sided printing, which then lets you select which edge of the sheet needs a binding margin (to punch holes, for example). That's explained clearly as either the long or short edge. 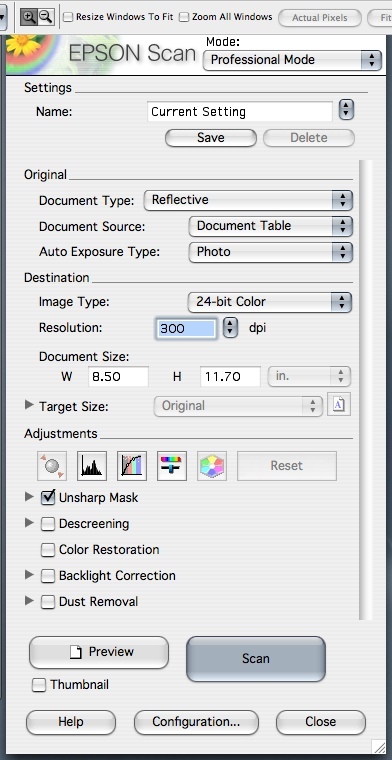 In a separate panel of the dialog, you select the document type among Text, Text with PHoto, Photo and Manual options. You can also adjust the Print Density and Drying Time. We had no problem with the duplexer itself, printing two-sided documents even on very thick paper. And it's a nice way to save a penny or seven, too. CD Printing. 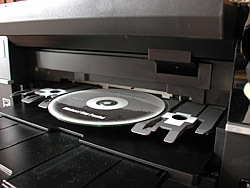 The Artisan can print from any of its sources onto a printable CD or DVD. For some reason Canon multifunction printers only permit this in their European versions. So it's nice to see Epson offering this to North Americans. We don't know of any other option. You can make a test print directly from the scanner glass or an inserted memory card, for example, to see what your image will look like before printing it on the media. Or you can use the included Epson Print CD application to lay out the label design. Print CD worked just fine for creating an attractive CD label. You can insert a background image and overlay text on it with special effects like a drop shadow. 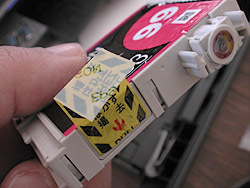 And, as on the printer itself, you can print a test label to see what your design will actually look like. To actually print the disc, you have to close the output tray, lift the control panel all the way up and press the CD Tray button on the control panel. A short gray tray will slide out so you can drop a disc on its spindle. Press the button again to retract the disc (or wait a few minutes for it to happen automatically), then print your label. The disc printed very quickly. When finished, the tray extends so you can lift your disc off the spindle. Our very first try resulted in a beautifully labeled disc. We only wish the contents would be worthy of it! One nice thing about printed CDs is that they are no thicker than the CD, unlike labeled CDs, which do add to the thickness of the media and can jam in CD readers. There is no transparency unit on the Artisan, so you can't scan negatives and slides. But you can scan from either the glass or the automatic document feeder. The glass can handle up to two photos at a time. 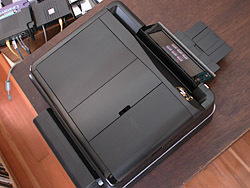 The feeder can scan up to 30 letter-size sheets (but only on one side). We found the feeder reliable and quick. With 4800-dpi optical resolution, you can do nice enlargements of small items with the Artisan. That isn't true of all AiO devices. Kodak, for example, limits their scan resolution to 1200 dpi. Epson didn't skimp on the bit depth either, scanning 16-bit channels (unlike Kodak's 8-bit channels). And you can scan to a thumbdrive, too (also not universally supported), or a memory card. We had a little trouble scanning from glass to a thumbdrive (we got a corrupted JPEG) but scanning from the feeder to the thumbdrive and saving as a PDF worked fine (except that the PDF was an image, not text). And yes, you can scan wirelessly. We scanned from Photoshop CS3 using the File Import command. 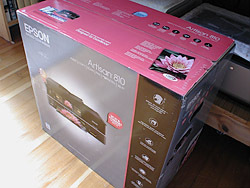 The Epson was listed and brought up v3.73 of Epson Scan (the same product we reviewed in our the Epson V600 review). We had a little trouble with our wireless scans to the computer. Our first scan (our old photo) was peppered with bright green pixels. The pattern did not resemble anything on the print or even the paper coating. Strange. 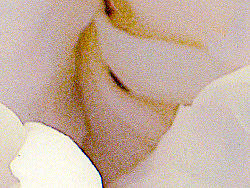 We tried another image, which was a closeup of a white rose (see above). No green hot spots but we did get a very noticeable dither pattern. We tried various settings in Epson Scan to get rid of it but nothing worked. Well, of course not. The scanner is so sharp it was picking up the screen pattern from the original! When we scanned a continuous tone black and white print, we didn't see the dithering. But we did see a lot of small white dots that reminded us of the green hot spots in the scan of the old photo. Were these reflections? Actually, they were dust particles. It never hurts to clean the glass between scans. Our old photo was really old and had some dust on it, which it left behind on the scanner glass. In fairness, we rescanned our old photo and got much better results. Still, we could see a few bright green pixels in the scan. We're not sure what to make of it. It's a fairly minor defect, but it's a defect. The wireless scans, by the way, came across very quickly, we have to say. Epson doesn't note any option to compress the data before transmitting it wirelessly, but it's as if it does. The Artisan has a trick or two up its sleeve worth pointing out. Apparently it can charge your USB device from the PictBridge port, for example. We say "apparently" because it couldn't charge our cellphone. It did have the decency to report that it didn't recognize the device when we plugged it in. Odd really because we have no trouble charging the phone from a computer USB port. 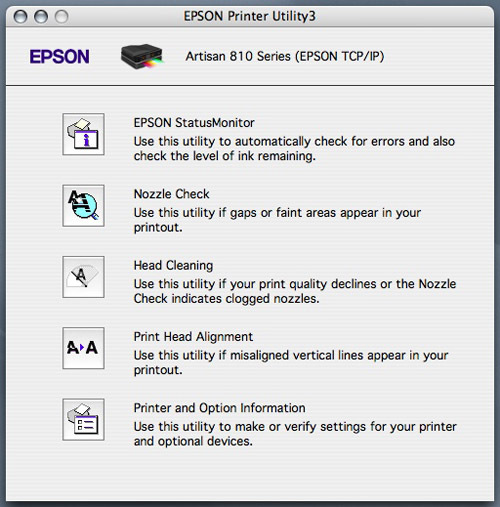 Epson's Utility program provides options to check the nozzles, clean the print head and align the print head. Apart from that the only maintenance required is to keep the glass clean and the white back board as well and to change the ink cartridges. Checking the nozzles prints a test pattern of lines that indicate you need to clean the nozzles if the lines are broken. You clean the nozzles by performing a head cleaning from the utility menu. 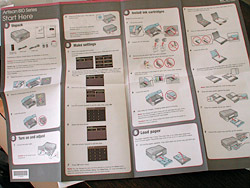 The Info Center has a lot more information on cleaning the Artisan, recommending a soft cloth for the LCD (which after all gets a lot of fingers stabbing it), a microfiber cloth for the ADF and dark copies of an empty scanner to clean ink from the paper feed rollers. The more time we spent with the Artisan, the more impressed we were. Epson promises an awful lot with this versatile device. Everything from faxing to CD labeling with scanning to and print from thumbdrives and memory cards tossed in along with extensive photo layout options and template printing. And all of it wireless, too. The only thing Epson doesn't promise with the Artisan is film scanning. If that's on your list, you'll have to keep looking. Promises are one thing, performance another. In almost every case the Artisan performed as promised. We found the CD labeling gorgeous, the photo prints from Photoshop top quality, the stand-alone photo copying very good. We had some problems with the scanning (much of which were our own fault), particularly scanning to a thumbdrive. But that was it. We're not entirely convinced the build of the Artisan is rugged enough for much abuse. There are a lot of small parts, delicate hinges (everything has a hinge on this thing from the automatic document feeder to the paper trays to the control panel) and wobbly supports (on the control panel). And it is a squat box that requires plenty of room for the duplexer on one side and the output tray on the other. More of an employee than a roommate, in short. But we haven't found the perfect multifunction device yet. And the Epson Artisan 810 will be just fine until we do.